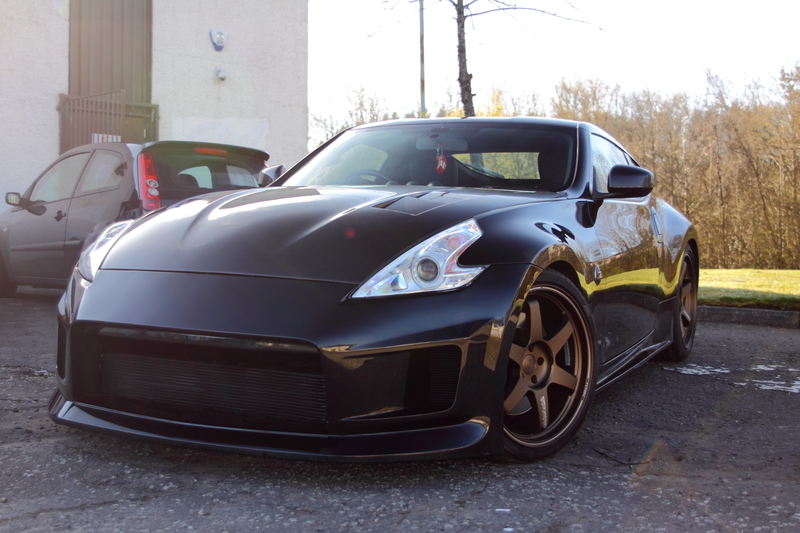 We’ve just finished work on a Nissan 370Z, which the owner installed a Stillen supercharger kit. 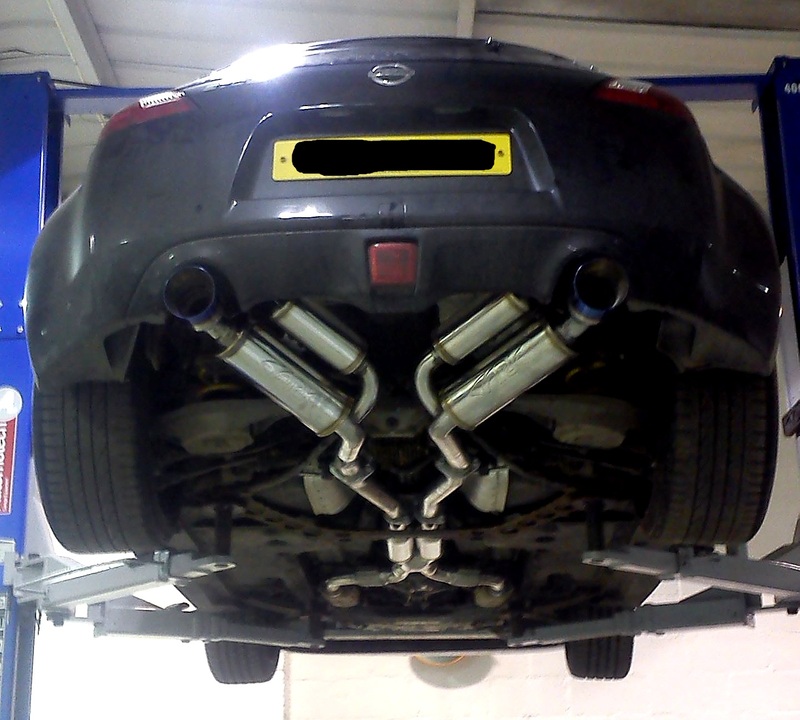 It was our job to install the supplied Nismo coppermix twin plate clutch to ensure the transmission was up to the job of handling the improved power, install the ARK cat-back exhaust when it arrived in the country and then tune the car using the Uprev software that was supplied by the customer. 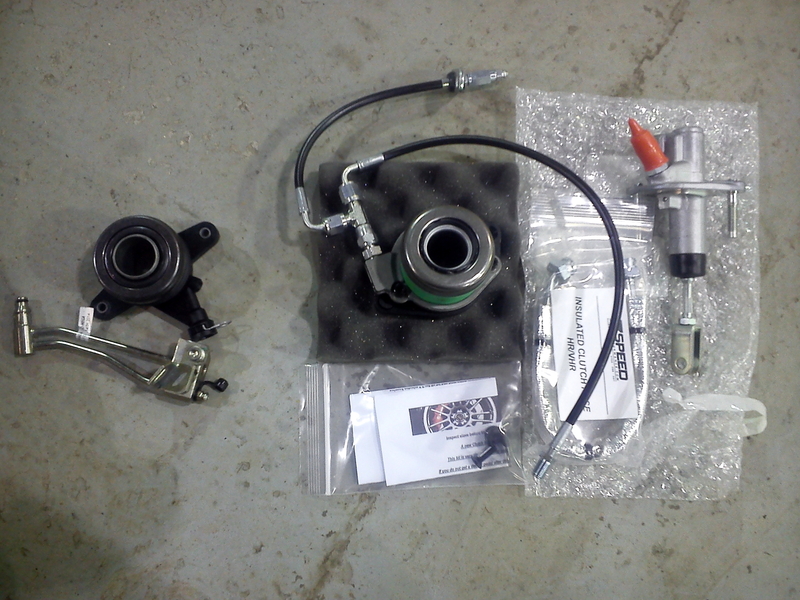 The supercharger kit included a water-to-air chargecooler, which installs as part of the inlet manifold, injectors and of course the supercharger. The owner had also installed a twin oil cooler set-up which uses one of the coolers all of the time and when the oil gets too hot a thermostatic control opens to allow the oil to flow to the second cooler. This was all very well installed and tucked beautifully behind the Stillen front bumper. When the car arrived it hadn’t been started to test anything due to the larger injectors not being calibrated yet so the first task was to check the oil system didn’t have any leaks, this was when the first problem was found, the routing of the oil hoses fell foul of the front anti-roll bar when the car was in the air, not a problem in some peoples eyes but as the anti-roll bar moves whilst the car is on the road there was now a chance that the hoses could become damaged, blocked or even burst from repeated contact so this needed addressed as a priority. A set of custom spacers were commissioned, tested and installed. 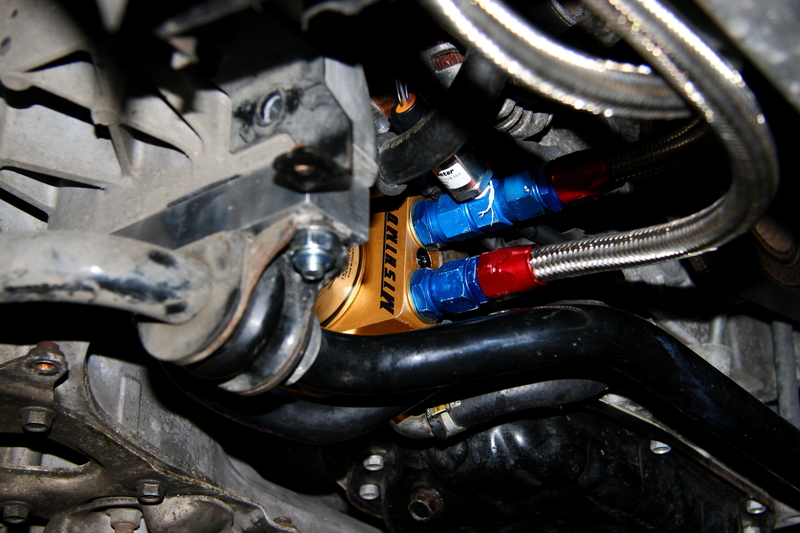 This now gave the anti-roll bar and oil lines clear space no matter how much movement there was. Next up was the clutch. The Nismo clutch kit came as a complete kit including a brand new OEM clutch slave cylinder as the slave is internal to the gearbox bell housing it can’t be changed easily so is advised that it is never re-used and always replaced if the gearbox is off. So as per instructions the clutch was installed as was the new OEM slave. The problem arose when it came time to bleed the slave, which can only be done once the gearbox is back in place. We initially couldn’t get a proper clutch pedal even with following the factory service manual method of gravity bleeding followed by traditional bleeding, it was then left over night and attempted again in the morning, after a while we managed to get half a pedal then ‘pop’ the slave cylinder burst! As the fluid that is used for the clutch hydraulics is extremely corrosive it was now a race to remove the gearbox and clutch off to ensure the friction plates of the new clutch weren’t contaminated. It turns out that the OEM slave cylinder is not up to the task of dealing with the stronger pressure plate which is part of the Nismo kit. A replacement, stronger, slave cylinder was sourced from a company in America, ZSpeed. ZSpeed also offered advice and some other products to ensure that the customer never suffered clutch hydraulic issues again. With the upgraded parts in hand the clutch and gearbox were installed again and we could move onto installing the ARC exhaust which had arrived. Now with the mechanics of the car complete we bolted the car to our Dynapack DAQ5 Chassis dynamometer. 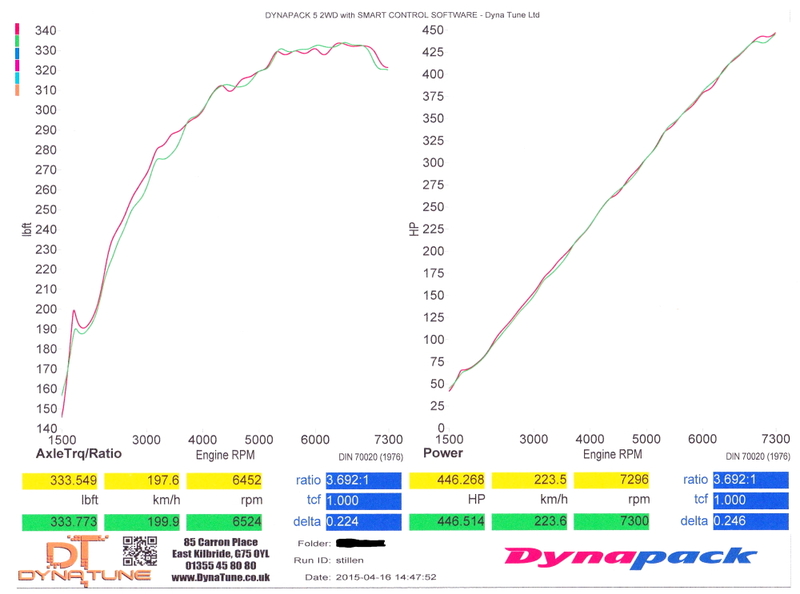 After an initial power run we began tuning, all couldn’t have went better with the car producing a very healthy 446 BHP at the hubs (roughly 490bhp flywheel if you like fudge factors).